Carrot Juice tastes delicious and is naturally sweet and creamy. In my childhood days, I hated vegetables so much. My mom used to run behind me to make me eat beans, carrots, beetroot etc. She used to tell me that carrots are good for eyesight and will frighten me that if I don’t eat carrots, I would lose my eyesight soon when I grow old. Still, it would be a big NO from my side. So my mom will make Carrot Juice and make me drink at least twice a week. Till I went to College, I had the carrots only in the form of juice. Now I do the same for Sanvi. I run behind her to make her drink this tasty Carrot Juice. Carrots are rich in Vitamin A, C, folic acid, and potassium etc. It is very good for eyes and bone density. Carrots also regulate blood. Since carrots has got so many health benefits, try to include them in your meals every now and then. If not, at least make this Carrot Juice and drink it once a while. Wash the carrots and peel its skin. Then cut the carrots into small pieces. Peel the ginger’s skin and cut it into small piece. In a blender, add all the ingredients and grind them smoothly. Strain the juice and serve chill. Now Carrot Juice is ready! You can add ice cubes at the time of serving. Remove the top of the carrot as it may be toxic. This entry was posted in Juice and tagged Carrot, Carrot Juice, carrots, lemon juice on November 22, 2014 by vikashbhardwaz. Limes (peeled) – 2 nos. Add ingredients to your blender and grind until smooth. Serve chill. 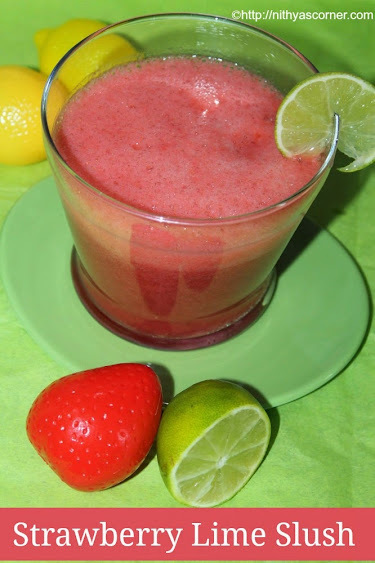 Now Strawberry Lime Slush is ready! This entry was posted in Juice and tagged strawberries, Strawberry on November 22, 2014 by vikashbhardwaz. Cut the watermelon and remove its seeds. Take out the red pulpy layer, and chop it roughly into pieces. Discard the outer white layer. 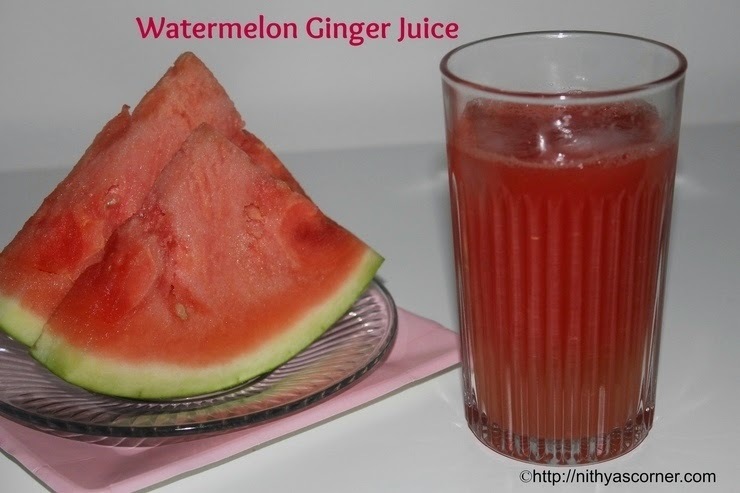 In a blender/mixer, add sugar, watermelon pieces, ginger and lemon juice. Do not add water as watermelon itself has water content in it. Refrigerate for a while and serve chilled. Drink watermelon juice fresh. As the time goes by, the juice will not have the same freshness and taste. 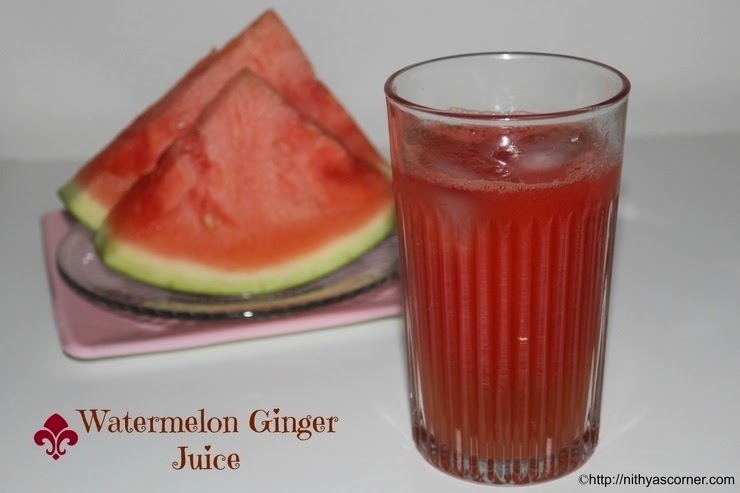 Now, Watermelon Ginger Juice is ready! 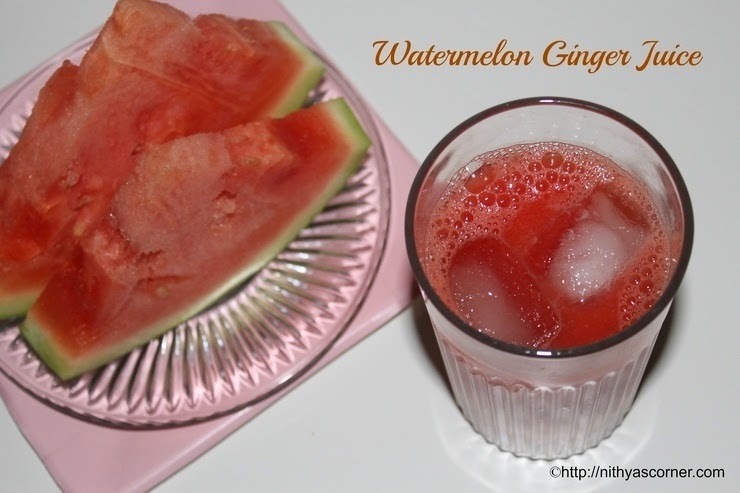 If your watermelon is good, your juice will taste good so choose a good watermelon. 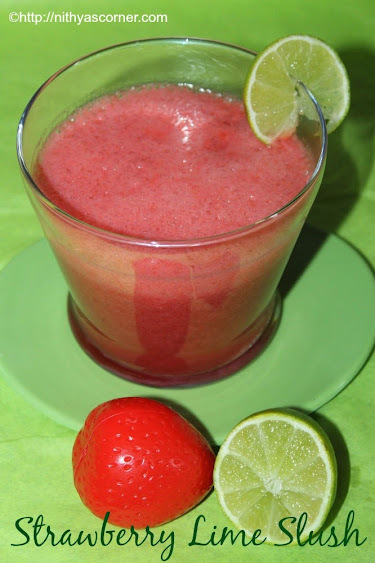 This entry was posted in Juice and tagged lemon juice, Recipe Category, watermelon juice, watermelon pieces on November 22, 2014 by vikashbhardwaz.